A travel writer takes a job with a shady publishing company in New York, only to find that she must write a guide to the city – for the undead! Because of the disaster that was her last job, Zoe is searching for a fresh start as a travel book editor in the tourist-centric New York City. After stumbling across a seemingly perfect position though, Zoe is blocked at every turn because of the one thing she can’t take off her resume — human. Why did I read this book: Because it sounded liked it could be camp, fun, light and funny. Zoe is searching for a fresh start and a new job as travel book editor now that she moved back to New York City after her last job ended badly (i.e. in tears, after she had an affair with her boss, who turned out to be married). She comes across a position as a managing editor for a new series of travel guides in a new publishing house. But every time she attempts to apply for the job she stumbles on several people telling her not to, including the owner Phil. As it just so happens, the publishing house is owned by a vampire, most of its employees are other assorted creatures and human Zoe simply doesn’t belong. Finding out that NY City has a subculture of monsters – the coterie – doesn’t really faze a desperate-for-a-job Zoe that much and desperate-for-a-managing-editor Phil hires her. Now she needs to learn everything she can about this new world and about the coterie so she can do her job properly. But everything turns south when she finds herself in the middle of a deadly fight for the soul of the city itself. There is so much silliness to Mur Lafferty’s debut novel The Shambling Guide to New York City that I ask myself: do I review this with any degree of seriousness? Yes, of course I review this seriously. Because even a light romp about a travel writer taking on a job at a shady publishing company in NY ran by a vampire and which caters to a (not so much) underground world needs to have internal logic, make sense and be competently written. I know that there might a fun book here somewhere. There is after all, humour t be had with zombies turned travel writers, right? But the execution of this story leaves a lot to be desired. It follows an extremely familiar story pattern following a Special Heroine that finds herself in a situation where she Must Learn and who is then Guided by a Wise Personage and everybody seems to “just know” that she is Special. It’s boring. And then we have the premise itself. I was expecting silly and camp (I mean, come on: travel guides…FOR THE UNDEAD! How awesome could this have been?) but I can’t get over how downright stupid the set-up is. Phil the Vampire decides to create a publishing house that caters for the coterie and sets up said company, rents an awesome office building, hires a bunch of employees (several writers, marketing guy, accountant, etc) but he still doesn’t have a managing editor or An editorial vision for his travel guides. So basically all these other employees are sitting around waiting for a managing editor. And because in the entire world of the coterie ( which, according to the world-building as put forth in the novel, seems to be extensive, densely populated and widespread) there is not a single person who could do this job. ONLY Zoe can be the managing editor, even though she is a human who knows absolutely nothing – zero, nada – about the world she is hired to write about. This is, quite frankly, the WORST business decision in the history of business decisions ever (and please don’t tell me this is how the publishing world works. My illusions will collapse like a house of cards at my feet). What this premise does do is to force the story to move a certain way: even after this decision is made Phil still refuses to tell Zoe the things about the coterie she needs to know to do her job because “vampires are secretive”. So Zoe takes upon herself to learn. Cue endless sections of info-dump, ridiculous enigmatic conversations, convenient connections between characters and set-ups in which Zoe comes across fae, goddesses, incubi, etc and does her “research”, thereby also informing the reader about the coterie and justifying the book. All building up to an ending that was extremely rushed, with a lot of hazy action sequences and an end-of-the-world event that felt incredibly small and localised. At the end of the day everything in here felt extremely contrived and forced to me. 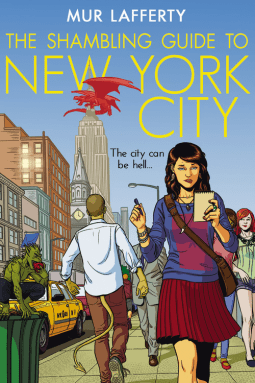 The story and characters were not interesting or vivid enough to allow me to get pass any of these problems in order to have fun reading The Shambling Guide to New York City. I had such high hopes for this book – it looked so cute! Thanks for saving me from reading it. I love Mur Lafferty’s short stories, so I might yet give this a shot … or not. I recommend her shorts, in any case. of you. Don’t treat a salesperson like a friend. Continue reading for some valuable tips and information. I’ve heard so many mixed reviews for this book, which is sad because I’ve read (and listened to, via podcasts) Lafferty’s works elsewhere and found myself really impressed with what she can do. I think I’m still going to give it a try, just to see which way I end up leaning, but thanks to many of the reviews I’m seeing online, I don’t think my expectations for it are quite as high as they were in the beginning.